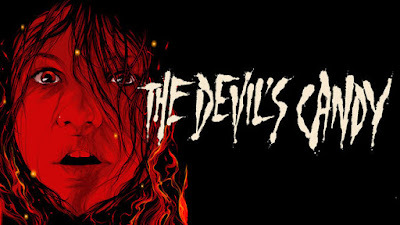 The title of Devil's Candy sets this film starring Ethan Embry and Kiara Glasco up to be a much shittier film than I got. The story of a tortured artist and his family in a seemingly haunted house, is a more than adequate B-movie, even with its thinly veiled christian overtones. 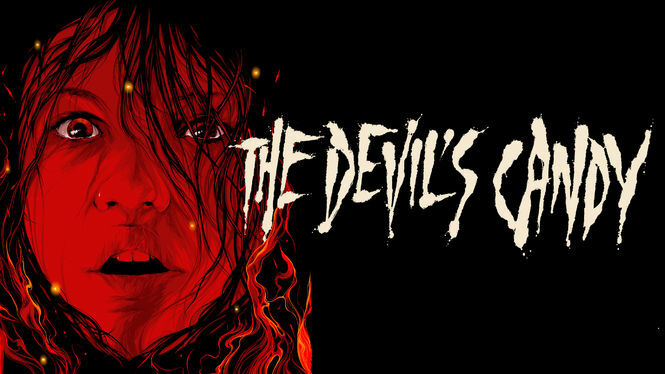 The film begins with a slightly deranged globe of a man murdering his mother causing a christian cross in the background to spin on its axis to become an inverted cross, just like Slayer are fond of doing at their gigs. I bring up Slayer as the heavy metal references in this are a plenty, I never realised just how infrequently 'my people' are represented in horror movies, especially since they are quite symbiotic, Black Sabbath essentially invented heavy metal after seeing a poster for the eponymous movie, and bands like Lordi, Iron maiden, Blind guardian to mention a few, have written many songs about the things that we love to scare us. Jesse decides to move his family into a house that has gone on sale for a pound, after the mysterious death of the previous owners, at the hands of their son, hamburglars biggest rival played fabulously by Pruitt Taylor Vince. The character is a truly disgusting man, acted brilliantly and giving off a creepy vibe, he is an unusual antagonist, a victim of his own role. All the girls I have ever met have had an instinctive repulsion to people like this but not Zooey (Gasco), she looks like she'd marry the grotesque man in exchange for a flying V. Which is a guitar and not a sexual metaphor, as I’m sure you know, but the letter V has so many solid connotations with female genitalia that I thought I'd mention it. However, in saying that her favourite guitarist is Kirk Hammet so she obviously has issues with judgement, taste and staring facts in the goddamn face. She must not have heard of Megadeth. Not long after they move in Jesse starts painting really awesome paintings that look like a tame Cannibal Corpse album cover, because of a voice speaking backwards in Latin. As backwards is the scariest direction and Latin the scariest language. For a horror movie it's very well shot, though in a 'top of the class at A level coursework kinda way, a bit too arty in some areas than was necessary, but most of the time looked great. On the downside the last act was just predictable, but didn't hang around too long, some of the conflicts seem forced, and the dialogue wasn't inspired. Overall a much better film than I expected, and the outro credits under for whom the bell tolls was pretty fun.